Super Time Force isn’t the game I thought it was. A quick glance at its insane onscreen action calls to mind classic bullet-hell shooters like Contra or Metal Slug, but spend more than five minutes playing it and a different picture emerges. While dodging bullets and taking out enemies is certainly part of the fun, the real appeal is all about playing with time, replays, character positioning, and an odd twist on speed running. Capy’s latest game forces players to think in new ways, and the thrill comes through the inventive routes to success. At any time during gameplay, the action can be voluntarily paused using a time-out. It also happens automatically if your character dies. At that point, you can rewind a few seconds, or even all the way to the beginning of the level, and expend one of 30 lives to replay the sequence with the same or a different team member, effectively teaming up with your earlier self. If you manage to prevent the death of your past self, that shimmering character becomes a pick-up that gives you an extra hit point and the additional super ability of the team member you saved. This process can be repeated and compounded as many times as you have lives to spare. The delightful boss fights can easily have over 20 iterations of you running about at once, each adding to the battle in their own way. You gather new members of your team along the way, from a machine gun-toting porpoise (Dolphin Lundgren) to a couch potato Jedi from the future. Each one has unique special abilities, and understanding the utility of these zany characters is key to defeating the many enemies. A laser blast that can shoot through walls might be ideal in one moment, while an explosive grenade with wide area damage could be just the ticket a few seconds later. Learning the advantages of each character is enjoyable, but combining their skills with the time-out system is where the depth kicks in. Each level has a punishing time limit that is challenging to complete with a single character, especially if you’re trying to pick up all the bonus items available along the way. But by layering in additional characters that blast enemies in your path and run down side corridors to pick up items, you open a path for a beeline run to the finish. A special exhilaration can be found in weaving among so many bullets and enemies, even as previous iterations of your characters clear the way ahead. The ability to replay an entire level dozens of times comes with some downsides. What at first seems like it should be almost impossible becomes easy once you have 10 allies onscreen firing off super powers. I only encountered a couple of levels that really taxed my full complement of 30 lives. The game also flirts with too much repetition, since you’re effectively banging your head against any given short stage again and again to succeed; it’s hard to miss a bullet pattern the tenth time it fires at you. Even if Super Time Force isn’t as challenging as it initially looks, the core mechanic is brilliant. At the end of each level, a full video replay begins, letting you sit back and enjoy the wild antics of your heroes. For those hungry for a harder experience, a new game plus mode ups the ante by requiring that you rescue every previous self from death, or they disappear from your roster for the rest of the level. 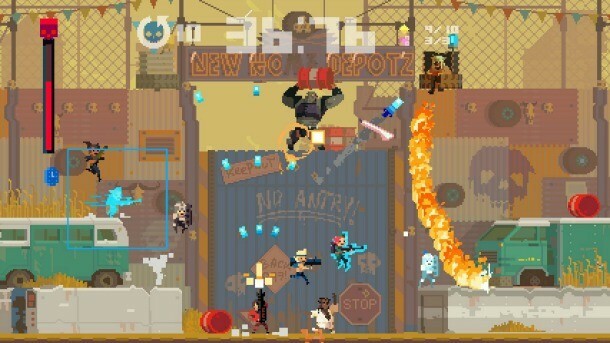 Super Time Force is a fascinating design experiment, and deserves your attention if only for its innovative twist on the classic shooter experience. Goofy humor and nostalgic visuals might be what capture your attention, but the reimagining of how we perceive time in an action game is what makes it memorable. Given the retro graphical style of Super Time Force, you’re not likely to notice any difference between the 360 and Xbox One versions. The Xbox One iteration includes a built-in way to take advantage of the console’s clip recording function, which is a bonus if you’re hoping to share your replays with friends.